* There are many Bluetooth devices with battery information inside. When they are treated as system battery, it will make the system poweroff/suspend/hibernate when some Bluetooth device has critical low battery. It is a very annoying behavior for the users. Originally, there is no such Bluetooth battery information until Ubuntu 12.04 brings linux-quantal-lts and linux-raring-lts, so those linux kernels also bring this issue. * Click the power indicator and you can find Apple Wireless Mouse is listed as system battery, and there is no Apple Wireless Keyboard. If you open gnome-power-statistics, you can find the 'Supply' field of Apple Wireless Mouse is 'Yes' but it should not be. * Most patches are from upstream, modified to fix the conflicts, and made by the same developer (i.e. fourdollars). * We need another patch from https://git.kernel.org/cgit/linux/kernel/git/torvalds/linux.git/commit/?id=d0a934b764c67b4bf626f5b7cf725a6e3066afd2 to make Apple Wireless Keyboard showing. This is a weird one... the system is an HP Pavilion 23 All In One and is powered by a large power supply brick. I currently have an Apple Magic Mouse connected via Bluetooth. As soon as the mouse is connected, the Battery indicator shows up and clicking on that shows that the system is reading my mouse as a battery! See the attached screen shot for what I see in the Power status. To make matters even more weird, I actually observed the battery indicator go from full to "Critically Low" and the system suspended itself. Keep in mind, again, that this system has NO battery, it's reading my bluetooth mouse as a battery device. I disconnected the magic mouse and the battery indicator went to Empty Red outline and status showed Battery Disconnected. additionally, when I turn the mouse off, the battery indicator goes to critically low and I actually sometimes get a Low Battery warning and the system suspends itself. See this shot and you can make out the Critically Low suspend warning I got just before the system suspended itself. This occurred after I turned the mouse off. Please increase the importance of this bug. It affects laptops heavily. The mouse battery shows as the system battery, which incorrectly affects system power management behavior. It makes laptops unusable on battery power. I made a patch to fix this issue. The root cause is in upower instead of gnome-power-manager. However the battery type is still recognized as a laptop battery. So I made another patch to fix the battery type issue. I made some Debian packages at http://people.canonical.com/~sylee/1153488/ . The attachment "02-try-to-work-out-if-the-device-is-powering-the-system.patch" seems to be a patch. If it isn't, please remove the "patch" flag from the attachment, remove the "patch" tag, and if you are a member of the ~ubuntu-reviewers, unsubscribe the team. I revised the previous patch to prevent from potential memory leak. `grep -r . /sys/class/power_supply/*hid*` seems to run forever. Is there other command that can run sooner? I can run `grep -r . /sys/class/power_supply/*hid*` in Ubuntu 13.04 without any problem. But when I run it in Ubuntu 12.04, it shows some messages like "grep: warning: ...: recursive directory loop". and attach /tmp/out.txt after that. Thanks! Thanks Martin for looking into this. we must be a great minority!? 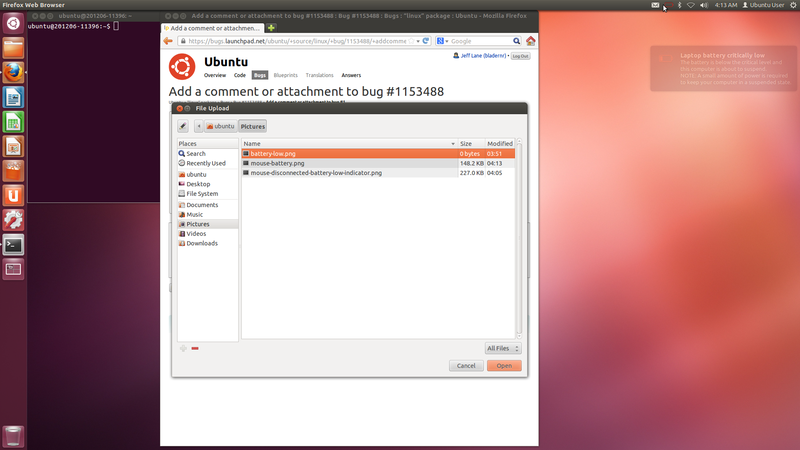 > ** Attachment added: "out.txt"
This bug is reported against Ubuntu 12.04. Agreeing with fourdollars. There have been a number of similar bug reports about this behavior, including https://bugs.launchpad.net/indicator-power/+bug/1195840. FWIW, not fixed in the staging ppa. Version 0.9.20-1ubuntu0.1 on raring fixed the problem for me. My Logitech Ultrathin Touch Mouse now shows up as a mouse instead of a laptop battery. 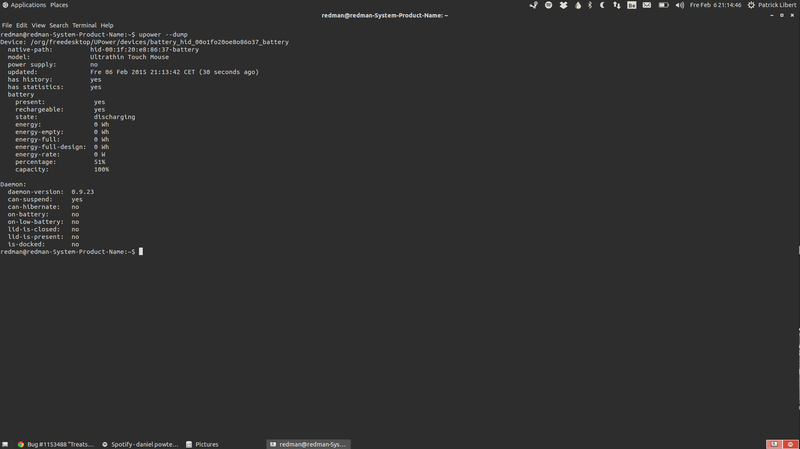 Version 0.9.15-3git1ubuntu0.1 on precise fixed the problem for me. My apple wireless mouse now reads as a mouse in stead of a laptop battery. I'm still affected to this problem. Would you mind to open another bug and provide more information of your bluetooth device? Is this bug about showing a wrong icon or showing the mouse battery at all? IMHO a mouse battery should not be shown at all. My Logitech wireless mouse has a non-chargable battery (primary cell) which runs a year (or longer) with the same battery. Its absolutely useless to show its status in favour of the laptop battery. My main concern is the laptop battery, not the mouse battery, and I wish to see laptop battery status all the time! This problem still exists in 14.04. This issue is about showing a wrong icon. It is only about the identification of system or device batteries in UPower. Please search other bugs or report a new bug for your problem. BTW, Logitech wireless mouse seems to have some specific protocol to detect the battery remaining power information in Logitech wireless mouse. Even a non-chargeable battery has its remaining power information. My bluetooth keyboard and mouse power is 0% after updating kernel. These are normal until updating kernel from kernel version 3.13.0-24. My environment is below and attach some information about power indicating. still present in trusty when using logitech wiresless mouse. surprisingly a4tech mouse does not display as icon on launcher. can some one suggest a fix? Same problem as in #43 above - bluetooth device showing 0% battery in all Trusty kernels since 3.13.0-24, which was the last one to work. On a Desktop computer WIHTOUT a system battery it 's still shows the wrong battery icon!!!!! On my Laptop WITH a system battery when the laptop is fully charged and connected to power it shows the mouse icon. I don't know if Shih-Yuan Lee (fourdollars) his patch is used but there is clearly a bug in the code!! The code should be changed so it should also look for a bluetooth mouse when "type = UP_DEVICE_KIND_LINE_POWER;"
So when you use a desktop pc without battery but with a bluetooth mouse so it shows the correct icon. I'm not really a programmer but could you check it? Could you provide the output of `sudo find /sys -name battery`? Is it not reconizing the Logitech Ultra thin Mouse correctly? Could you provide the output of `upower --dump`? My previous patch at comment #51 is mainly for bluetooth. It is unrelated to your native-path: /sys/devices/pci0000:00/0000:00:1d.2/usb8/8-1/8-1:1.1/0003:046D:C52F.0002. Could you attach a screenshot for your icon? I just performed a apt-get upgrade this afternoon and started seeing this issue with my Logitech K810 Bluetooth keyboard and Dell XPS 13 laptop. Pretty sure it wasn't there before. The laptop now shows the keyboard battery in the top panel. When I click on the battery icon, I can see two batteries listed, the first one is the keyboard battery which is the actively displayed in the top panel, the second the laptop's battery. See attached screenshot, the keyboard battery is identified as a laptop battery. Sorry, forgot to mention, I'm running 14.10. uname -r outputs 3.16.0-29-generic. Is your patch included in Ubuntu 14.10? My patch has been included in the upstream, and it is also in the Ubuntu 14.10. 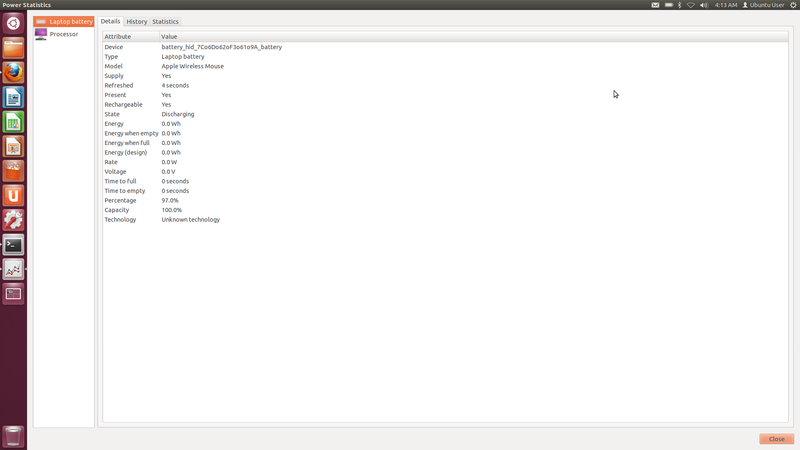 It is also modified by other developers, so it has been a little different from the one I made in Ubuntu 12.04. I think the problem is that some rule is changed in UPower, but the mechanism to detect Bluetooth input devices doesn't change accordingly. Same/similar issue here on 15.04 with a Mad Catz Mouse and a laptop. The icon in the notification bar averages both the mouse and the laptop batteries in order to show one (1) laptop battery value. 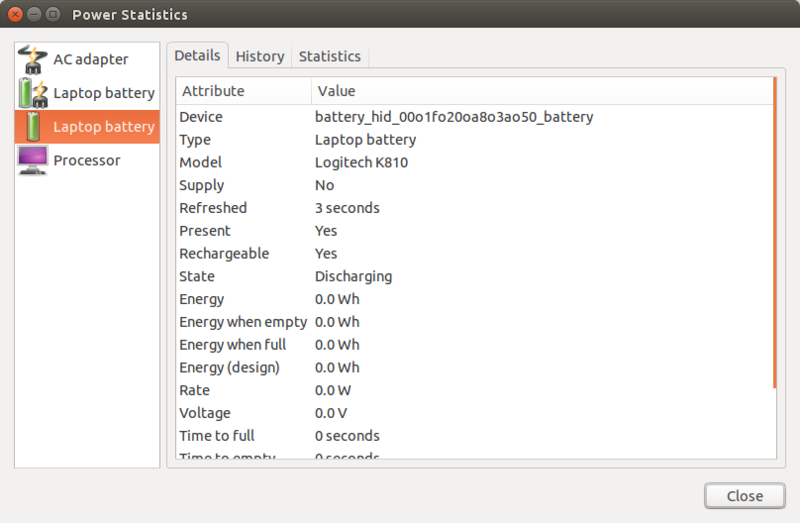 If I open the Power Statistics screen, both batteries are listed as laptop batteries. I am also seeing this on Ubuntu 15.10 with a ThinkPad Wireless Bluetooth Keyboard. Specifically, my ThinkPad keyboard is being detected as a system battery. This is concerning as the system is a Desktop with no battery. Since the wireless keyboard is being detected as a keyboard Power Manager is set to shut the system down when my wireless keyboard power gets low. re: comment 64, correction. I meant to state I am running 15.04. I am currently seeing if purging upower will work around the system shutting down if keyboard batter power is low. I'm getting this error on Mint 17.2 w/kernel 3.19.0-26 too. My bluetooth mouse seems to be fine (no battery registering), but my keyboard is showing as a 2nd laptop battery. It keeps disconnecting my keyboard so I have to press a button to wake it back up. Guessing it may be putting it to sleep because of an idle setting somewhere?